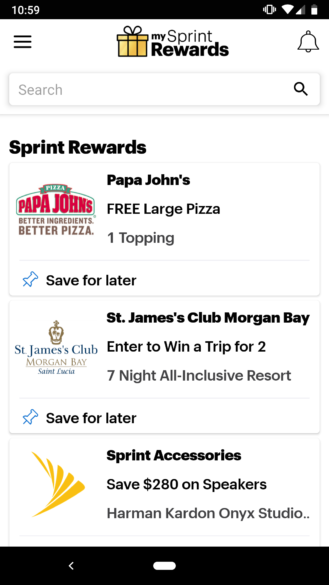 As T-Mobile and Sprint's merger sits on hold during the government shutdown, Sprint has taken a leaf from its future business partner and launched a rewards program. 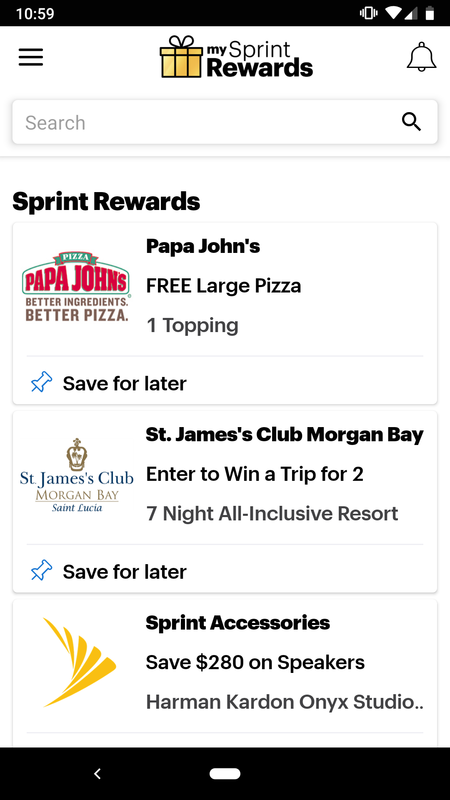 My Sprint Rewards, much like T-Mobile Tuesdays and the similar offerings from Verizon and AT&T, is essentially a coupon app, offering discounts on things like clothing and fast food, or allowing users to enter larger draws for free vacations. Unlike T-Mobile Tuesdays, there's no specific day of the week that rewards are released - deals will be added "regularly" and customers are encouraged to check back often. 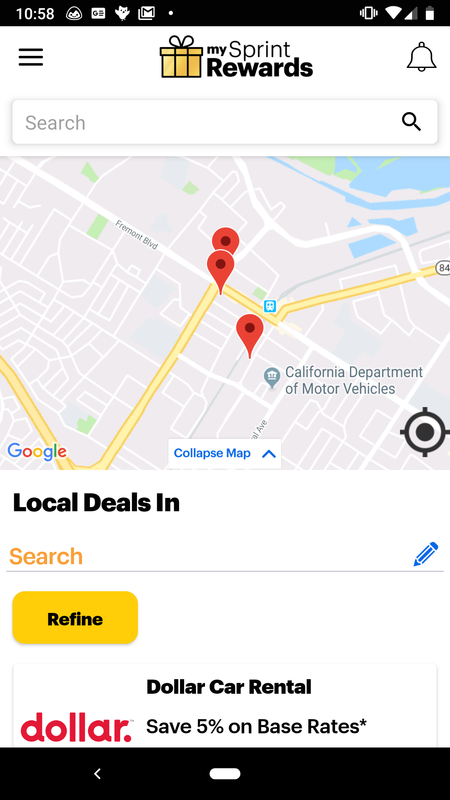 Below, see some of the offers Sprint is touting so far. 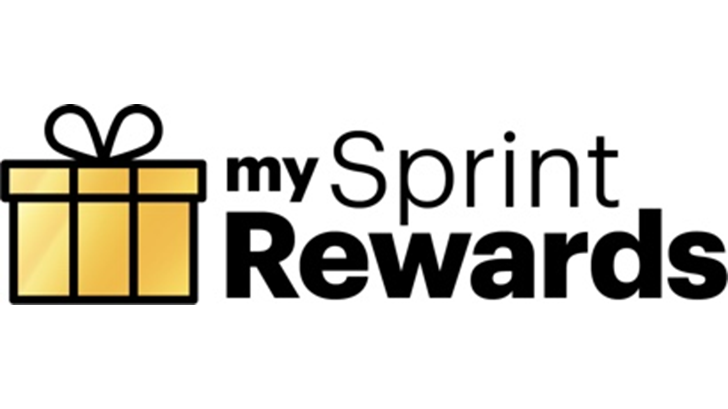 The rewards program is nearly identical to Boost Perks, the rewards program for Sprint subsidiary Boost Mobile. The most-liked review on Boost Perks' Google Play Store page offers a chilling account of what can happen if you place too much hope in getting free pizza. On a serious note, but still related to the pizza, the offer from Sprint is only free if you pick it up from a Papa John's store. If you want it delivered, there's a $11 minimum order value. On a fully serious note, these programs offer very little in the way of actual value, and certainly don't meaningfully offset the monthly prices of mobile plans - but if you can manage to save a few pennies through My Sprint Rewards, it's worth it to check out. The app is available via the widget below, or you can find it on APK Mirror.